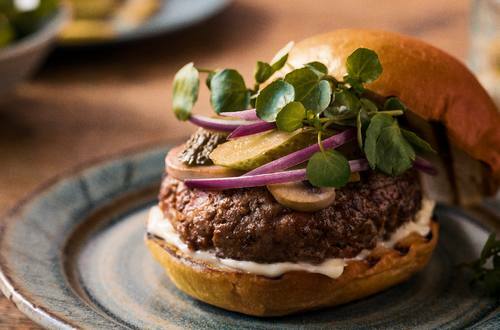 This burger is an absolute classic recipe executed to perfection. Toasted brioche, sweet tomatoes and woody mushrooms are the dream combo to create this sensational succulent burger. Add a secret twist by mixing a dollop of mayo into your patty mix for that extra mouth-watering bite! 1 For the burger, start with 600g of topside beef, roughly minced. 2 Thinly slice 50g of bacon. 3 Whisk two eggs into the mixture. 4 Add a tbps of Hellmann’s Mayonnaise into the mix. 5 Put the ingredients together by hand until consistent, then split them into 4 parts. Press into burger patties, grill until desired.